What is happy? When we say it or see it, does the word itself make us happy? Does it look like what it infers? Does the sound of it cheer us? Where does happy come from? Now that it’s the time of the season when we are all wishing each other happy this, happy that, let’s consider it. We can attain happiness with some luck and without worry (happy-go-lucky!). Our constitution provides for “…the pursuit of happiness.” There’s “Happy Birthday!” And when drinks are discounted and the snacks are free? That’s a great time called Happy Hour! In Being Happy, Andrew Matthews writes, “It is not what happens to us in life that determines our happiness so much as the way we react…taking responsibility for our own happiness.” And, “To be happy, we need to concentrate on happy thoughts…” Such are aspirational words we may choose to live by. 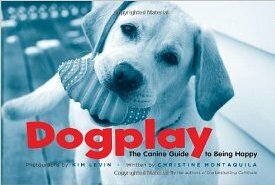 In Dogplay: The Canine Guide to Being Happy by Kim Levin and Christine Montaquila, pictures of playful dogs and their “quotes” teach us a thing or two about what it takes to be happy. “Don’t microanalyze every nice breeze that comes your way.” The cover is enough to make anyone happy. And don’t we all have songs that make us happy? It could be the lyrics, the singer’s voice, or the sound of the instruments. Some address happy directly. Consider these. Happy Together by the Turtles (“…so happy together.”), Happy by The Rolling Stones (“…I need a love to keep me happy, Baby, baby keep me happy…”), Jump Into the Fire by Harry Nilsson (“We can make each other happy…”), and Over The Rainbow by Harburg and Arlen (“If happy little bluebirds fly beyond the rainbow, Why, oh why can’t I?”). Happy. Not only a feeling of joy, a sense of security, fulfillment, and possibility, too. It is what we seek, dream about, and hope to attain. Almost always, there’s a positive feeling about it. To be happy or not to be. That is the question. Choose happy. A happy holiday season to all. I think implies works better than infers…see Lollapolingo entry! Hmm…would you believe that I was just testing you? Didn’t think so. Thanks for the careful read. Please do come back to keep me on track!